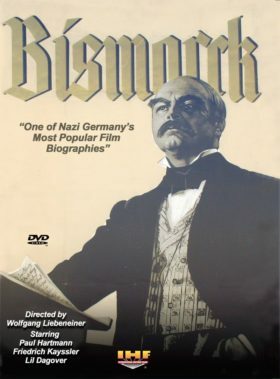 (1940) Bismarck stars Paul Hartmann (Ich klage an) as Otto von Bismarck, the creator of Germany’s Second Reich following the Franco-Prussian War of 1870.It follows the Prussian chancellor’s fortunes up to the founding of the German Empire in 1871. The film was directed by Wolfgang Leibeneiner (Ich klage an) and co-stars Friedrich Kayssler as Wilhelm I and Lil Dagover as Eugenie. Ufa, Germany’s leading studio, produced the picture as one of their Staatsauftragsfilme (“state produced films”) which indicated overt political content. Similarities between Bismarck, the architect of the Second German Reich and Adolf Hitler, who created the Third Reich, are underscored throughout. DVD.